The 23rd Session of the African Committee on the Rights and Welfare of the Child (ACERWC) was held in mid-April in the African Union’s new and shiny headquarters in Addis Ababa, Ethiopia. The Committee has a mandate to monitor the implementation of the African Charter on the Rights and Welfare of the Child which has been ratified by 47 out of the 54 member states of the African Union. It has been in existence since 2001 and its workload has increased significantly in recent years, although it remains hampered by resource constraints. As well as reviewing periodic reports from states, ruling on communications regarding violations of children’s rights and conducting investigative missions, the Committee has begun work developing General Comments – these are authoritative interpretations of important aspects of the African Charter and, although not legally binding, they are very influential and can act as a catalyst for reform for children’s rights across Africa. In November 2013, the Committee adopted its first ever General Comment on Article 30 of the Charter, which is a unique provision in human rights law and outlines provisions for the ‘special treatment’ of mothers who are in conflict with the law. 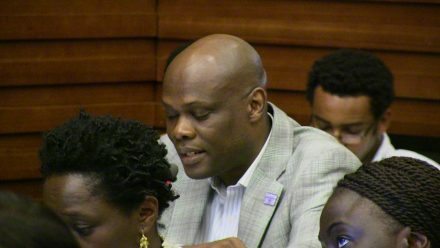 PRI Board member Olawale Fapohunda and PRI Associate Frances Sheahan attended the 23rd Session to offer support to the Committee in promoting this new General Comment which PRI had helped to develop. ‘If a child is to be […] imagined as an individual with a distinctive personality, and not merely as a miniature adult waiting to reach full size, he or she cannot be treated as a mere extension of his or her parents, umbilically destined to sink or swim with them.’ This quote from Justice Albie Sachs from a 2007 judgement in the South African Constitutional Court on the duties of a court when sentencing a primary caregiver, introduces the General Comment and sets the scene for its focus on the rights of children as distinct from the rights of their parents or caregivers. It carefully considers how the four general principles of the African Charter should be applied. Children should not be discriminated against because of the criminal status of their parents/ caregivers; the authorities should take into account the best interests of the child when taking decisions regarding parents’ arrest, pre-trial measures, trial and sentencing, imprisonment, release and reintegration into the community; the right to survival, development and protection must be protected so, for example, children living in prison with their mothers should live in an environment that is as close as possible to that of a child outside of prison; and children should have the opportunity to participate in judicial or administrative proceedings concerning their parents that affect them (providing they are capable of communicating their views). The Committee is eager for this General Comment to be widely known and used by States and civil society alike. It is hoped that ongoing review and monitoring of how governments treat children whose parents are in conflict with the law will help to lift and improve their situation across the continent. PRI will be supporting this process – so watch this space for further developments.